Rich and Flavorful cookies with saffron. 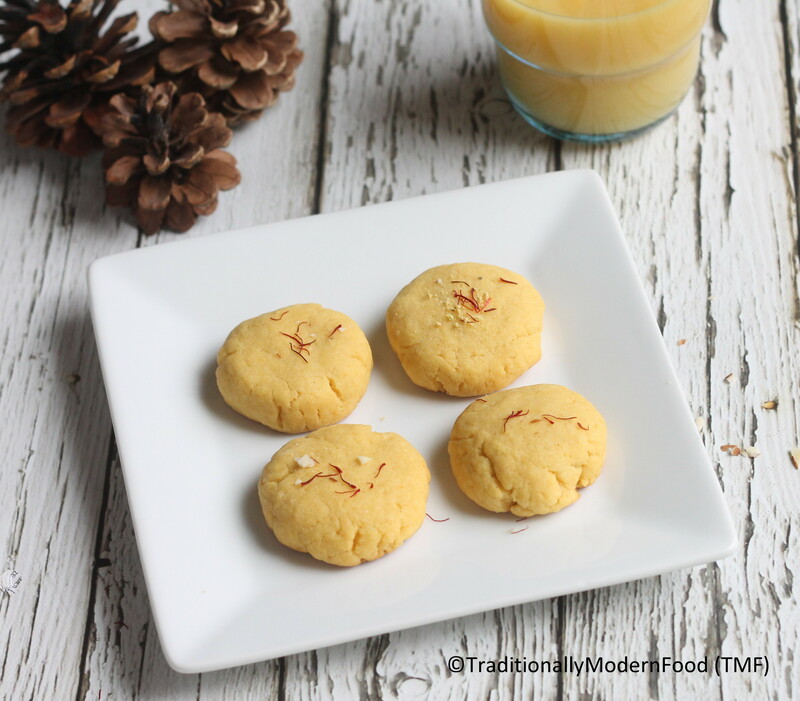 Saffron cookies are addictive tea time snacks. Kids can’t say no to this Crunchy delight. Egg-less/ Eggfree cookies tastes delicious. Last Thursday my parents came and I know I won’t be active that weekend as my sister also visited us for a short 3 days trip. I kept this Saffron Cookies ready in draft but weekend just went super quick as always I become lazy. Today Amma reminded me not to take break like last year and yes here is the post. Saffron gives amazing flavor to the cookies and of course lovely color which will definitely please the toddlers/ kids. My son always complains that I make cookies only in White/ brown, but now their is one more color without adding food color. With kids it is not always the taste but look, texture etc. I love baking dishes with butter. Even while baking, the aroma makes the cookies so addictive. Butter compliments the saffron cookies well. Usually most of my baking involves keeping butter in room temperature. This one is handy. Microwave the butter for a minute. Whether it is ghee or melted butter these cookies are always the winner. You can also use brown butter. 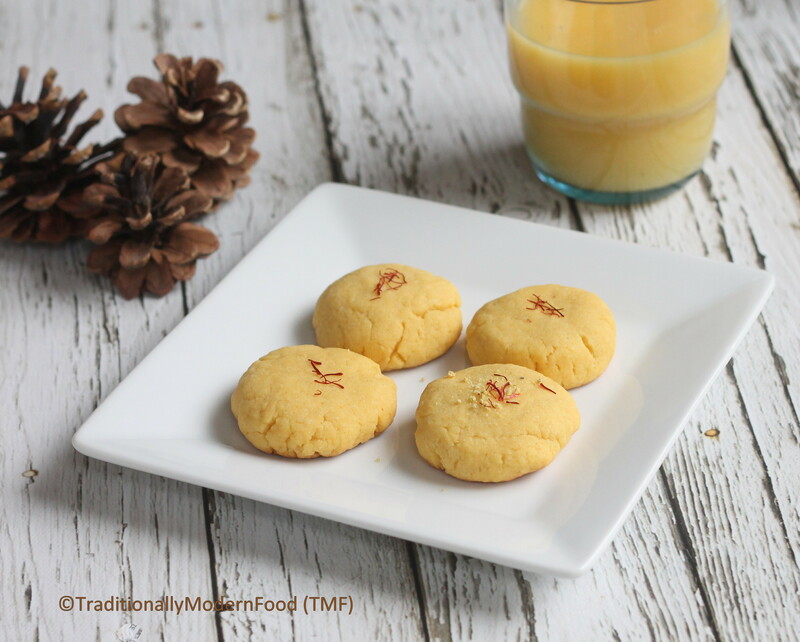 Little salt and cardamom powder enhance the saffron taste and makes the cookie super yum. My favorite part of this cookie is the tool used for mixing. No whisk/electric or hand mixer. Hands work perfect for the dough. 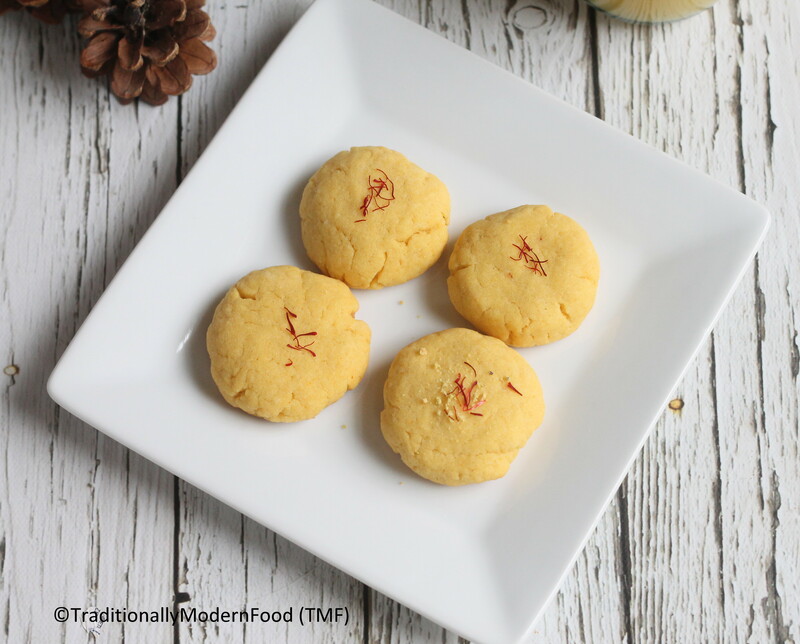 Gently kneaded dough makes delicious Saffron cookies. Usually I use powdered sugar for cookies. Instead of buying confectionery sugar I decided to powder it at home. Pulsing the milk and saffron gave perfect color to the cookies, and grinding the sugar along with it is super easy. Cookies can be prepared within 30 minutes. 12 -15 minutes for baking and max 15 minutes for end to end cookie making process. Cookies stays good for weeks if kept in air tight containers. Rich and Flavorful cookies with saffron. 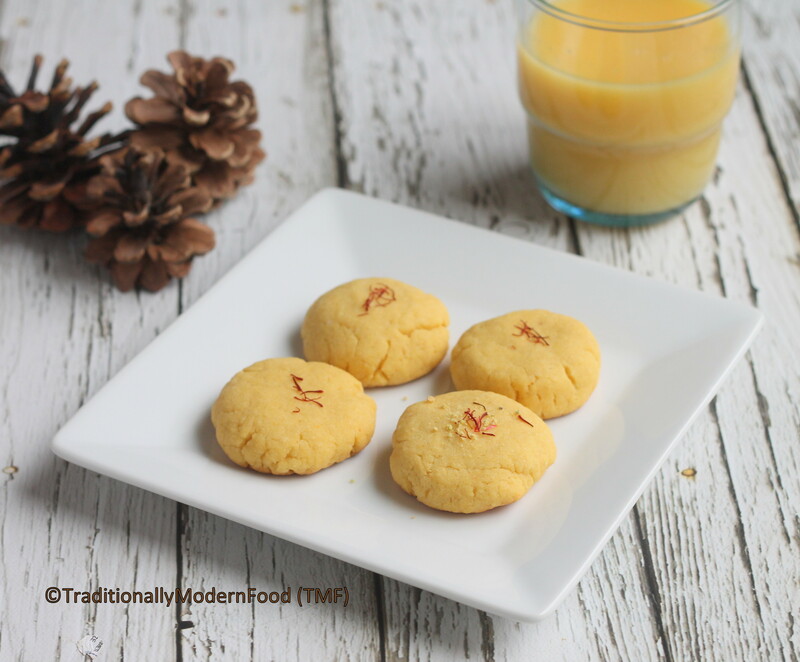 Saffron cookies are addictive tea time snacks. Kids can't say no to this Crunchy delight. Egg-less/ Eggfree cookies tastes delicious. Saffron cookies are my favourite. I just love the aroma when the cookies are baked. Made these. They were yummy. But had a little bitter taste. What cud be the reason? Is there no soda or baking powder used for the recipe?